The Allen and Elizabeth Becker Library is a vibrant center for research, study and collaboration at the heart of St. Stephen’s campus. Becker Library is a welcoming environment that provides a wealth of print and electronic learning resources to our whole community. Becker Library provides computers for general use and wireless service throughout the building. Our onsite computer lab is a useful space for classes, meetings and conferences. We take great pride in our print collection and enjoy making reading recommendations to all. Our librarians teach information literacy skills, collaborate with instructors, and assist classes and individuals with all aspects of research. Throughout the year, we plan special programming for the community. 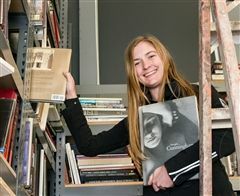 Library outreach includes orientation sessions, academic strategy sessions, author visits, student field trips, fun literary events and book discussion groups. The Friends of Becker Library Committee includes all parents who volunteer in various ways to support the library. The committee plans and supports two major school-wide events: the annual Holiday Book Fair and Haitian Marketplace and the biennial Literary Festival. * Here is a list of our reading selections from past years. Our Book Fairs provide fun shopping opportunities and wonderful reading selections for the whole St. Stephen's community! A portion of the proceeds benefits the library and provides funds for new books and other resources for our students. 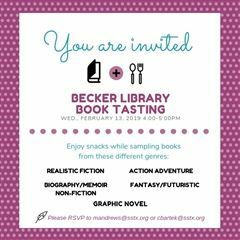 These great events are made possible by the many talented volunteers of the Friends of Becker Library Committee. Join us at our spring Book Fair which coincides with Grandparents' Day! Another exciting event sponsored by the Friends of Becker Library is the biennial Literary Festival. On that day, a wide variety of notable writers will visit St. Stephen's and give presentations about their writing to our students. Every student attends two presentations of his or her choice. Several authors will be on hand to share lunch with students, too. We are grateful to the many Friends of Becker Library volunteers who help engineer this enriching literary event for our community!